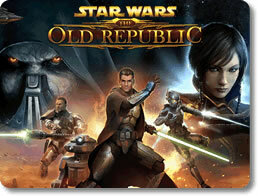 Star Wars The Old Republic Game - Download and Play Free Version! Save the Galaxy? Rule the Galaxy? You Choose in this Star Wars MMO! Play One of Eight Character Classes in the Star Wars Universe! Join the battle for the Star Wars galaxy! Do you want to play as a dark Lord of the Sith or a pure Jedi? Do you prefer to sniff out plots against the Empire as an Imperial Agent, or would you like to lead the carefree life as a Smuggler? In this highly-acclaimed massively-multiplayer online role playing game (MMORPG), you make all the choices as you play through the galaxy-wide conflict between the Republic and the Empire. You’ll have the option to join the Empire or the Republic and play through one of eight different character classes. On the Republic side, you can play as a Jedi Knight, a Jedi Consular, a Smuggler, or a Trooper. If you join the Empire, you can choose to play a Sith Warrior, a Sith Inquisitor, an Imperial Agent, or a Bounty Hunter. All eight class stories are woven into the rich fabric of the SWTOR story. You're not limited to the human species, either. You can also choose Twi'lek, Zabrak, Cyborg, Chiss, Pure Sithblood, Miraluka, Mirialan, and Rattataki. Each class has a unique story, which is the strongest feature of this game. Your goal as a Republic player is to save the galaxy from being taken over by the evil Sith and the Empire. As a player for the Empire, your task is to crush the Republic and the Jedi. 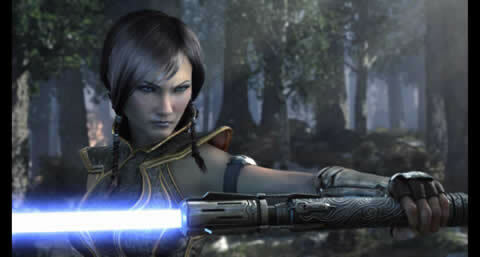 The game is set in the Old Republic era, about 3,600 years before the events in the Star Wars movies. 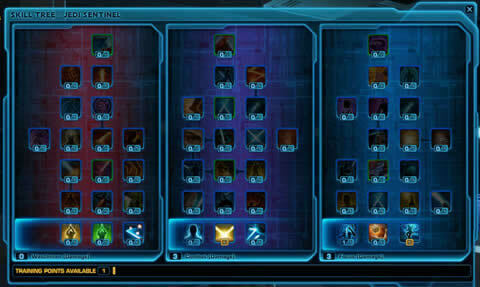 In SWTOR, you’ll be able to customize your character from the very start. You’ll choose the species, gender, class, and appearance. Your story starts as soon as the legendary movie crawl begins. 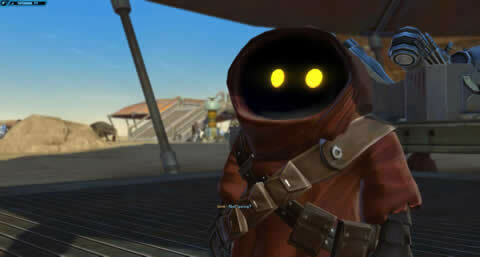 The goal as you play through your first planet is to learn how to use your unique set of skills, weapons, and equipment to complete quests and missions. You’ll gain skills and abilities as you gain experience points and levels. You'll also earn lots of credits that you can use to upgrade your weapons, armor, and even your abilities. Once your reach level 10, you'll have the option to select an Advanced Class, or AC. This lets you further customize your play. Each AC has three skill trees which refine your abilities even more. Choose the one that fits your play style best or that you think you'll enjoy the most. The goal is to have fun! While you can play SWTOR solo and enjoy it thoroughly, it’s even more fun and rewarding to play the game with friends. 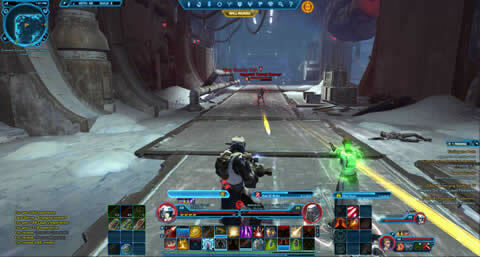 SWTOR encourages group play with Heroic Missions, Flashpoints and Operations which require four, eight, or sixteen players. The class stories are well written and completely voice-acted, which enhances role-play immersion. 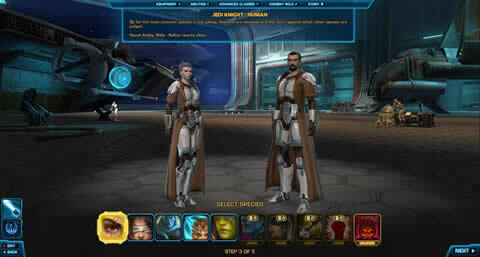 Each person can play as a Light Side or Dark Side character, adding depth to the dialogue choices. In addition, each class has five companions who join the player at various points in the game. The different options to complete their personal class quests and win favor with them add further layers of complexity. You’ll have hundreds of hours of replay available in SWTOR. There's Still More to do in Game! If eight complete stories are not enough, there are plenty of other things to do in SWTOR. Crafters will appreciate that their companions gather resources and make items for them, leaving the crafter to continue gameplay. Why stand at a workbench when you can save the galaxy? You’ll be able to choose between six different crafting skills. Depending on what craft you choose, you’ll be able to make armor, weapons, upgrades for equipment, weapon crystals, stimulants, medpacs, grenades, ship parts, and even personal speeders. If you were thrilled by the dogfights over the Death Star, you’ll have the chance to recreate the experience with space missions once you earn your spaceship. Once you reach level 50, you’ll be able to tackle the most intense Heroic space missions. Do you yearn for elite missions that challenge you to the maximum? If so, you’ll love Operations. These eight- or sixteen-person missions will take you to some of the most dangerous parts of the galaxy for the most dangerous battles in the game. Those who love player-versus-player, or PvP, play will find lots of it. There are PvP servers, open PvP regions on Ilum and Tatooine, and five different PvP arenas called Warzones. You can fight single players on PvP servers or have large faction battles in the open PvP regions. Most PvP players battle in the different Warzones. 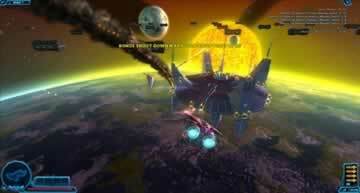 There are different objectives in each of these eight-versus-eight scenarios, such as holding points in Novare Coast or rushing through enemies to the datacore in the Voidstar. You’ll try to control turrets in Alderaan and open portals The Ancient Hypergate. 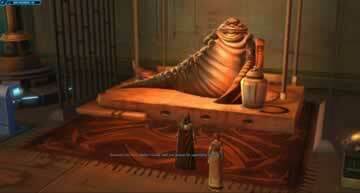 You’ll even have the chance to participate in the infamous game of Huttball. It’s like rugby with fire pits and acid baths. Some of our favorite memories from the Star Wars movies are the twin suns setting over the sand dunes of Tatooine and the majestic music of the Throne Room. SWTOR does a phenomenal job with both. The 18 different planets all have different styles, from the Coruscant cityscape to the Tatooine sands to the breathtaking comets and asteroids in the Ilum night sky. The music and voice acting add tremendous depth to game immersion. You’ll recognize musical themes from the Star Wars movies as well as both Star Wars: Knights of the Old Republic games. Graphics and sound settings in game are easy to customize so that the game will run at its best whether you’re using an older PC or the latest machine with the most advanced components. PCs using a built-in graphical chipset are recommended to have 2GB of RAM. Video Card - Star Wars: The Old Republic requires a video card that has a minimum of 256MB of on-board RAM as well as support for Shader 3.0 or better. SWTOR is rated Teen by the ESRB. Romances are limited to a ‘fade to black’ scene after a kiss. There are some dark themes in the game, like slavery, assassination, and murder. There is violence during battles, and some of the Sith look downright scary. Parents will need to use their judgment when determining if SWTOR is appropriate for children in their very early teens. The game is extremely accessible for those with disabilities or physical limitations. It won the 2011 AbleGamers Mainstream Game of the Year for its ability to be customized to meet all sorts of needs. There is a decent guild management system in SWTOR. Five people are needed to start a guild, and the Guild Registrar. Leaders have the options to add or change ranks and set up a guild bank. They can also determine officer permissions and bank access. There are many guild activities to do in game, from sharing quests to tackling Operations or Warzones to crazy hat costume contests. Guilds looking for more members can check out the SWTOR.com Server Forum for their server. If you want to find a good guild to join, look through the forum for your server. Many guilds advertise there. Contact the leader and speak with some of the members. Try each guild out for a week or so and find if they mesh with your play style, interests, and gaming times. When a good guild coordinates activities, crafting skills, and events, everyone benefits from the fun! 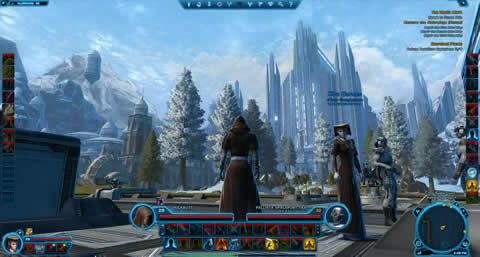 However you like to play an MMO, SWTOR has an amazing storyline and a broad array of features that will appeal to you. Download the game and join in the fight for the galaxy!